The 5 Mystics comes out this Friday! In a few days players will be able to get their hands on these brand new cards and really see how powerful they can be. This is going to be the last part of my series talking about each individual Mystic and their spells. This week I am going to talk about the water and light ones. I am not sure if you noticed but I decided to go backwards on the civilization scheme for Kaijudo. Instead of starting with light and working my way down to nature, I started with nature and finishing with light. I did that because the light Mystic is a very unique card for Kaijudo, but I will get into that later! This is another 9 cost spell, just like Absolute Darkness. This card has you look at the top 3 cards of your deck, then put a non-evolution creature from among them into the battle zone and the rest go to your hand. So at the worst case, you draw 3 cards, which compared to Reverberate, does not seem so good. I think this spell will only see play in top heavy control decks. In order to make this card worth it, you are going to have to build a deck around it. 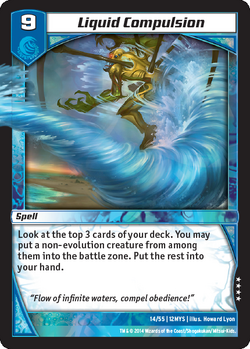 Right now the only creatures that make this card viable are the Monarchs. Being able to play a 10 or 11 cost creature on turn 9 and draw two cards seems pretty good to me. 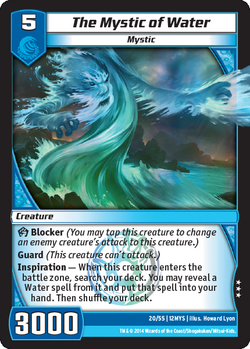 I think one of the dream plays with this card is to cast it, play [ccProd]Eternal Haven[/ccProd], and then with her ability, you play the Mystic of Water and search your deck for another copy of Liquid Compulsion. This is a card for people who like variance and are willing to take a chance. It is definitely a fun card and I know some people who will try to make it work. Finally we are at the last one, the Mystic of Light. Surprisingly, it is the strongest out of all of them. He costs 7 and has 7500 power and is a double breaker. It is also the only Mystic with two abilities. The first one, Clarity, allows you to retrieve a light spell from your discard pile and put it into your hand. So you can get back that Reverberate you just played on the last turn. I am not too impressed with this ability because it seems like in most cases I would rather just play [ccProd]Keeper of Dawn[/ccProd] instead. The huge power helps though. The highlight of this card is the second ability though. 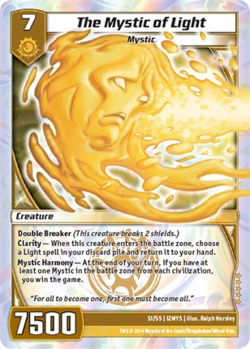 It is called Mystic Harmony, which says, at the end of your turn, if you have at least one Mystic in the battle zone from each civilization, you win the game. This is something we have never seen before in Kaijudo, an alternate win condition. Though getting all these creatures out will prove to be quite difficult. I do not even remember the last time I had 5 creatures out, let alone specific ones from each civilization. This is defiantly going to be one of the first decks I am going to try though just for fun. I want to see the look on my opponents face when I pull this off. When you think about it, some of the spells really help this out, Swift Regeneration helps you get Mystics out from your mana zone and protects your creatures for a turn and Liquid Compulsion will help you dig deep in your deck for that last Mystic you may need. This also brings us to the last spell. Radiant Purification costs 10 mana, the highest costing spell in the game so far. This card has you target two enemy creatures and shuffle them back into your opponent’s deck and then taps all the other ones. If you are able to cast this card late game, it could completely turn the game around in your favor, depending on what you have in the battle zone, there is a strong chance you could wipe out every creature your opponent has with this spell. My favorite part about this card is that it can be another version of [ccProd]Stormspark Blast[/ccProd]. I know it is 4 turns later but in a control mirror, you normally get to this late game. 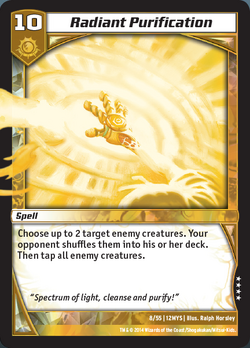 The one thing I have been wanting more of in Kaijudo are cards that help against the creatures that cannot be targeted and this helps a lot. I have gone through each 5 Mystic and each of their spells. Which one is your favorite? I cannot wait for this set to come out in the next couple days. I really think these new cards are going to shake up the Kaijudo scene and create whole new ways to play. Hope everyone enjoyed this little series and remember it is not all about winning, but having fun!